Don’t just pursue Justice: do it right! 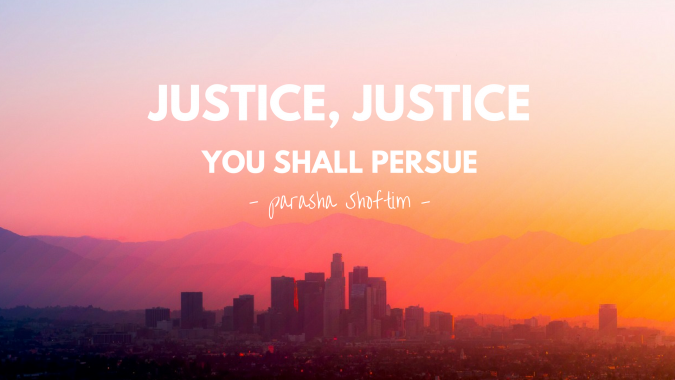 The parasha Shoftim (meaning “judges”) teaches us that justice is not obvious. In these chapters, we find some general laws for the society, concerning crimes for instance, but there are also particular commandments, for the Levites, the army and even the King. Yes, justice is complex. That’s probably why we need to pursue it, and never believe that we can achieve it fully. However, there will be a time when the nations will be ruled with complete justice and righteousness: when Yeshua will sit on the throne as the King of the whole Earth. That’s such a good news! Yet, in the meantime, we can grow and improve ourselves. Therefore, the repetition of word “tzedek” can lead to different interpretations. First, it emphasis the fact that justice is one of the most important things to seek for in life. It’s also the first stone of the Kingdom of God. Another interpretation is that we should seek not only for personal righteousness, moral and ethical way of life, but also that we should address injustices in our society. Finally, not only should we pursue justice but also pursue it in a righteous way. This does not support or encourage any fanaticism which imposes one’s own justice above all or tries to do God’s work! That’s a very dangerous path that our modern world knows too well. Let’s pray that Israel would be an example among the nations in pursuing justice. Israel is not a perfect state (there is none!) and has a lot of social issues to deal with. May the Lord give wisdom to its leaders, political as well as religious leaders, both in their challenges.